Located in one of the early prime residential areas of Redlands and originally bearing the address “173 Times,” this two-story house was completed in 1901 for $1,500. Charles Schulz and his wife, Henriette, purchased 1 1/2 lots in the Lugonia Tract from George F. Norton for $375. Construction began in early 1901.The newly built home was subsequently sold on May 5, 1901 to Jacob J. and Susan Kindscher. Widowed in 1903, Mrs. Kindscher continued to live in the home with her son Logan until her death in the mid-1930′s. Logan Kindscher, an apiarist, was still in residence in 1947. 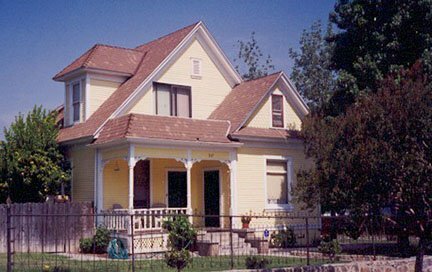 Mr. and Mrs. Andres I.
Lopez purchased the home in July 1980.In a residential district dating from the 1890′s, this eight-room “survivor” is a late-constructed example of Queen Anne architecture. The wood-shingled roof has two offset large triangular dormers with windows, one with overlapping clapboard, the other with fishscale shingles. The remaining three dormers, one on each side of the roof, are hipped with windows. The porch on the southeastern corner features decorative columns with a leaf pattern at the top. Cut stone is featured in the base of the early wrought iron fence surrounding the front and side yard. Cut-Stone curbing survives along the north and east edges of the property.In 1996 Robert and Josephine Sierra became the new and current owners of this delightful home. Redlands area Historical Society is honored to re-designate this property and present a replacement plaque to the new owners.